On July 21, 2012,the John McEnroe Tennis Academy at SPORTIME Randall’s Island is once again offering talented local players the opportunity to visit the Academy to try out to win a full-year scholarship to the John McEnroe Tennis Academy. Starting in September 2012, JTMA will expand its geographic reach with annexes at SPORTIME Bethpage on Long Island and at our beautiful new facility in lower Westchester, SPORTIME Lake Isle in Eastchester, and scholarships will be available for players at all three locations. We hope that you will join our other Academy players and become a part of what we have created for NYC area tennis players and especially for juniors and future American stars. Click here for the 2012 JMTA Scholarship Tryout Day Registration Form. Tryouts will be held on July 21st at SPORTIME Randall’s Island with registration and check in starting at 8 am. The day should be complete by 3 pm. For a full schedule of the day’s events, please click here. All those wishing to participate in the tryout day must complete and return the Registration Form by Tuesday, July 17. 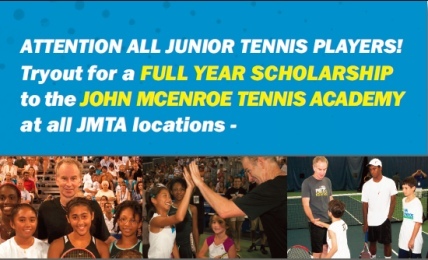 For more information, visit www.JohnMcEnroeTennisAcademy.com.